In the past I’ve blogged about deprecated and discontinued functionality in SSAS 2014 and SSAS 2016; I forgot to check what’s deprecated and discontinued in SSAS 2017 until last week but it turns out that there are a few things that are worth knowing. A deprecated feature will be discontinued from the product in a future release, but is still supported and included in the current release to maintain backward compatibility. It’s recommended you discontinue using deprecated features in new and existing projects to maintain compatibility with future releases. A discontinued feature was deprecated in an earlier release. It may continue to be included in the current release, but is no longer supported. Discontinued features may be removed entirely in a future release or update. As far as discontinued features go it’s straightforward: everything that was deprecated in SSAS 2016 is now discontinued. For SSAS MD that means remote partitions, remote linked measure groups, dimension writeback and linked dimensions are now discontinued; I don’t think these features were ever used by more than a small number of people. 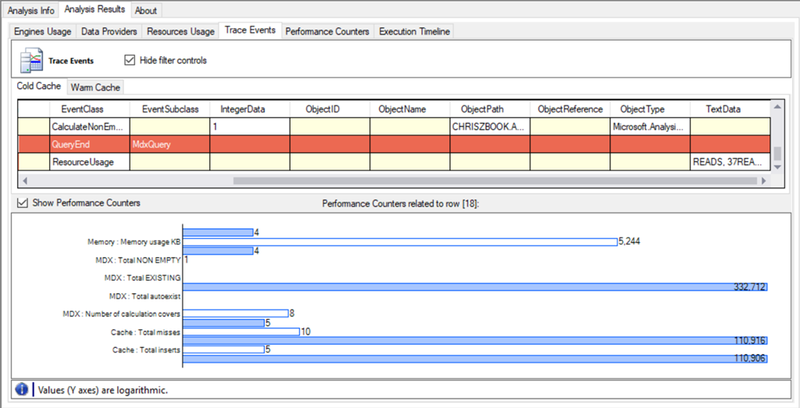 Profiler is discontinued too and that’s more of a problem, given that the UI for Extended Events in SSMS remains awful and unusable for the kind of query performance tuning tasks I use Profiler for (I blogged about this issue here). The state of tooling for SSAS is already pretty bad and if Profiler stops working in the future the situation will be even worse; is it right that we have to rely on community-developed tools like DAX Studio and Analysis Services Query Analyzer, however good they are, for tasks like performance tuning? UPDATE 30th April 2018: it turns out that Profiler was put on the ‘discontinued’ list by accident, and in fact is still only deprecated. The documentation has now been updated appropriately. SSAS Multidimensional data mining. Given that it has not had any new features now for a long, long time (even longer than the rest of SSAS MD) and was never very popular in the first place, I’m not surprised. However the example of Microsoft’s first, failed attempt at brining data mining to a wider audience is interesting in the light of the company’s attempts to do the same thing with Azure Machine Learning and other services. As far as I understand it the technology was never the problem and it was about as easy to use as it could be, so why did it fail? I’m not the right person to answer this question but I suspect the reasons include the following: Microsoft BI customers were not ready for data mining back when it was first launched; customers who did want data mining didn’t want to buy a product from Microsoft; very few Microsoft partners had the skills or experience to sell it; and finally is it even possible to do proper data science in a user-friendly GUI with no coding? 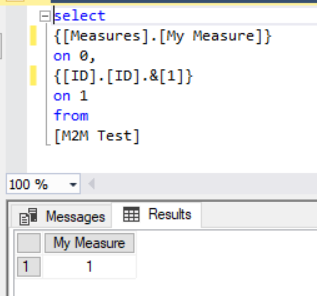 SSAS Tabular models at the 1100 and 1103 compatibility level (for SSAS 2012 and SSAS 2012 SP1). Anyone that is still running Tabular models at this compatibility level really needs to upgrade, because they’re missing out on the great new features that have appeared in SSAS 2016 and 2017. Building aggregations in your SSAS Multidimensional will make your queries faster, right? While that’s true, they will only make a noticeable difference to performance if your query has Storage Engine-related problems rather than Formula Engine-related problems. What’s more, even when do you have Storage Engine-related problems there are some cases where you may find that aggregations don’t give you the kind of performance boost that you expect. 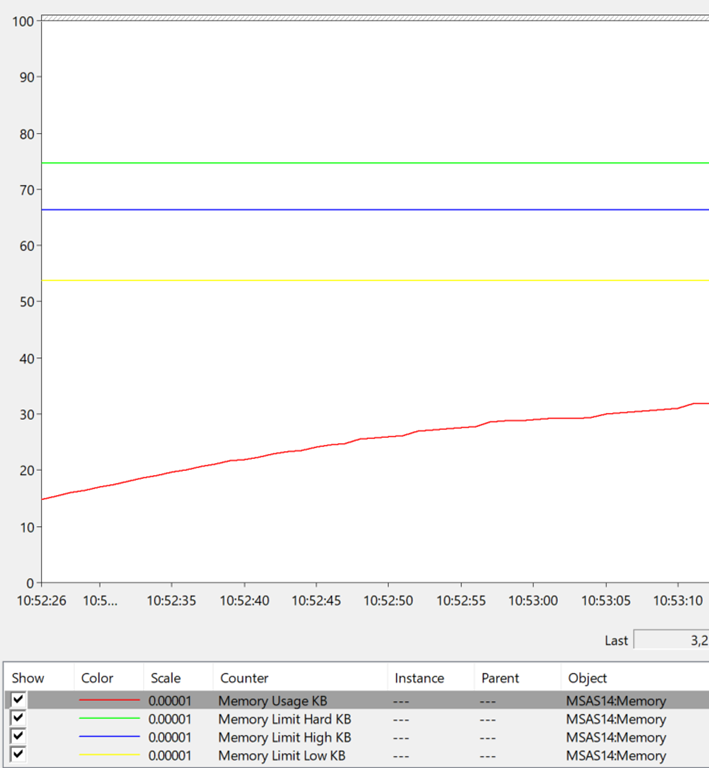 In this post I’ll explain why this can happen, how you can use the Resource Usage Profiler event (as described in parts 1 and 2 of this series) to find out when this is happening, and how you can deal with the problem. Most importantly they contain pre-aggregated data. For example your fact table might contain data at the Day granularity but an aggregation might contain fact data aggregated up to the Year granularity. This means that when a query needs to get data at the Year granularity, SSAS does not need to read the fact table-level data stored in the partition, it can read the data it needs direct from the aggregation without needing to aggregate any data at query time. Secondly, because the size of an aggregation is usually a lot smaller than the size of the fact table-level data stored in a partition, it is much faster to read data from an aggregation. However, regarding this second point, there’s a catch: you’ll know if you’ve read the previous posts in this series that SSAS builds indexes on fact data so it can scan that data very quickly, but most builds of SSAS do not build indexes on aggregations. 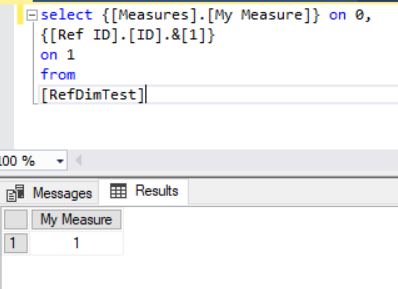 I say ‘most’ because there were a few builds of SSAS that did build indexes on aggregations, but as this article explains this feature was turned off soon after it was introduced because it was found that the time spent building those aggregations was not usually worth any gain in query performance that resulted. Notice that the ROWS_SCANNED value is now 5000. 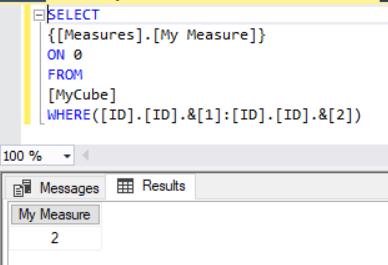 This is because the aggregation has no indexes built on it so SSAS has to scan all the rows in the aggregation. Reading data from an aggregation at the same granularity as the fact data is therefore a lot less efficient than reading data from the original fact data. Of course, since most aggregations are usually much smaller than the original fact data, the lack of indexes is not so important because scanning all the data is going to be very quick anyway. However, on very large cubes you may need to build some very large aggregations and find that even when your queries hit these aggregations, performance is still bad because of this lack of indexes. If you see this happening, and can see the ROWS_SCANNED value in the Resource Usage event reporting very high values, then it might be a good idea to enable the building of indexes on aggregations. You can do this by changing the values of the AggIndexBuildEnabled and AggIndexBuildThreshold server properties in the msmdsrv.ini file. Setting AggIndexBuildEnabled to 1 allows SSAS to build indexes on aggregations. It’s not necessary to build indexes on all aggregations though: you can specify that only aggregations larger than a certain number of rows have indexes built using the AggIndexBuildThreshold property. The only public documentation for these properties is given in two articles here and here, and I strongly recommend you read these articles so that you understand the implications of doing this on your processing times. You should only consider changing these properties if you are a very experienced SSAS developer and you monitor the effects carefully – I’m not even sure if changing these properties is supported by Microsoft. You probably know that using many-to-many relationships or non-materialised referenced relationships can be bad for Analysis Services Multidimensional query performance. How can you measure their impact, though? 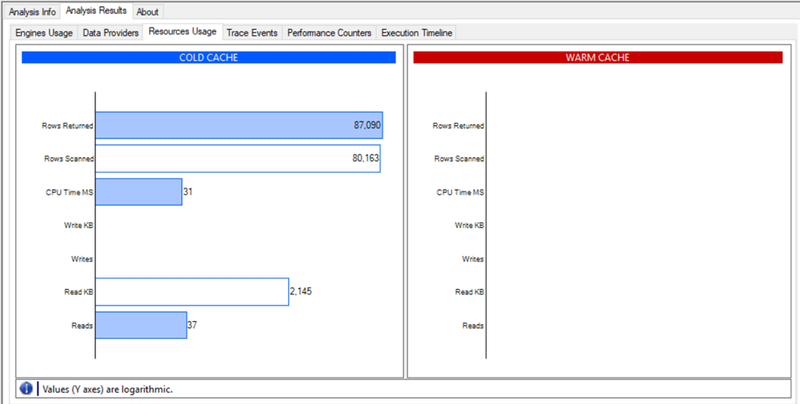 In the first post in this series I showed how the Resource Usage Profiler event could be used to to monitor Storage Engine activity; in this post I’ll use it to show the effect of using these features on the amount of Storage Engine activity that takes place during query execution. 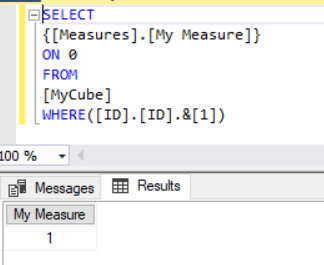 In my previous post I built a very simple SSAS cube with one measure group called Fact from a table with 5000 rows, then built a dimension called ID from that same table with 5000 members on its only hierarchy. 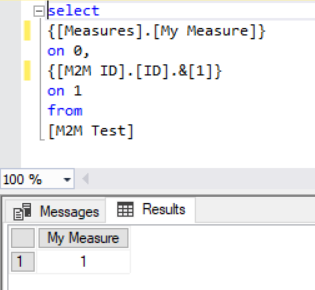 For this post I added a second measure group called Fact Bridge based on the same table, added a new role-playing copy of the existing dimension called M2M ID, and then created a many-to-many relationship from this new dimension to the original measure group via the new measure group. Because all the dimensions and measure groups are built from the same table, one member on the M2M ID dimension is linked to just one member on the ID dimension, so selecting a member on the M2M ID dimension will give the same result as selecting the member with the same key on the ID dimension. Even though SSAS see a many-to-many relationship, in the data it’s a one-to-one relationship. The ROWS_SCANNED value has gone from 256 to 5256, and ROWS_RETURNED has gone from 1 to 5003! Why? Part of the explanation is that we now have two measure groups that must be scanned, and the Resource Usage statistics are totals for all Storage Engine activity across all measure groups. In this query the Fact Bridge measure group is scanned first to resolve the many-to-many relationship between the M2M ID and ID dimensions, and then the Fact measure group is scanned to get the value for the measure My Measure. The Fact Bridge measure group only accounts for 256 rows scanned and 1 row returned though, the remaining 5000 rows scanned are from the main Fact measure group. The problem here is that SSAS does not translate the filter on the M2M ID dimension into a filter on the ID dimension (this is a limitation of the way SSAS handles many-to-many) so all the rows on the main Fact measure group get scanned in this query. This explains something that I have blogged about before here, namely that if you partition your measure group by a dimension that is used in a many-to-many relationship you’ll see that all partitions are scanned and not just the partitions you expect to be scanned. 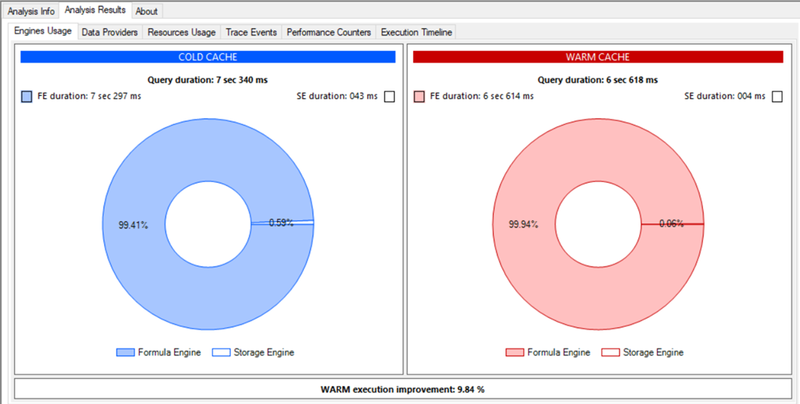 The Resource Usage event shows that even when you don’t see unexpected partition scans happening, using a many-to-many relationship in a query can result in a lot of extra Storage Engine activity and therefore potentially worse query performance. Something similar happens when you use non-materialised referenced relationships (although materialised referenced relationships are OK). To test this I created another variation on my original cube, with just one measure group and the ID dimension as before but now with a new, role-playing instance of the ID dimension joining to the measure group through the ID dimension using a non-materialised referenced relationship. 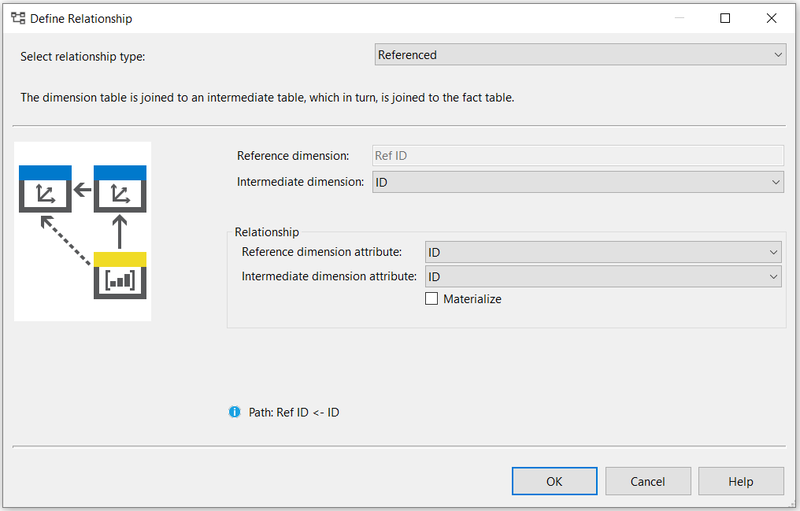 I’m not much of a fan of referenced relationships anyway – you can usually get rid of them by redesigning your SSAS dimensions or your underlying dimensional model – so this one more reason not to use them.